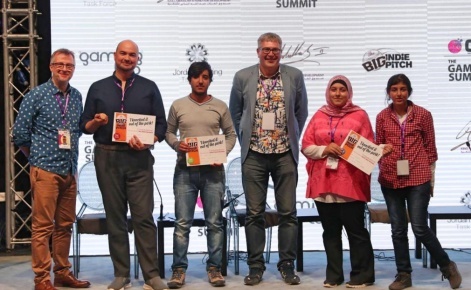 Last week a creepy puzzle adventure from Saudi Arabia, A Cat's Manor, bagged the top Big Indie Pitch slot at The Gaming Summit in Amman. Tariq Mukhttar and his indie studio Happiest Dark Corner beat a dozen other competitors to impress the judges with his game about an amnesiac cat with a hand for a tail. The Big Indie Pitch is a game pitching event we run about 20 times a year, all around the world. It's a chance for small teams to present their in-progress projects to a panel of press, publishers and industry experts. They get feedback, make new contacts, and maybe win a prize. The 2018 Jordan pitch took place on Saturday, November 3rd at the Jordan Gaming Lab and welcomed teams from Jordan and all over the MENA region. It was sponsored by our season sponsor G-STAR. The judges included representatives of Epic, Voodoo, No More Robots, THQ Nordic and more. A Cat’s Manor is an immersive puzzle-based adventure about personal discovery. Waking up without any memory and seeing a hand attached to the end of his tail, our unlikely victim must piece together what has happened, and what looming dangers are closing in on the house where he's trapped. It will be released in late 2019, first on PC then on iOS and Android. The judges praised its level of detail and fresh, innovative feel. They also described it as pleasingly scary. Tariq Mukhttar promises "unique visuals, movie quality soundtrack [and] professional voice acting that breathes life into a truly immersive experience" for A Cat's Manor. Winning the Big Indie Pitch means his Happiest Dark Corner team walk away with a ceremonial baseball bat – to symbolise "knocking it out of the park" – a signed certificate, press coverage, a pass for a future Pocket Gamer Connects event and some promotional spend on our network of sites. Second place went to Crimson, an educational language game. The Sakura.Jo team are a pair of young girls, showing the rest of us how to overachieve with several games and five languages to their name. Crimson teaches kids numbers, letters, colours and shapes in Arabic and English. It tells a story of rabbit Crimson and cat Rose, who find themselves in a strange land. Can you help them collect carrots and fish by providing the correct answers? The judges remarked on the ability of the team given their young age, but even excluding that observation they praised its concept and ethos as well as the strong pitch delivery itself. Third prize went to Happy Leap by Salah Abu Ali. It's an early in-progress game about spreading happiness among sad people by giving away flowers as you run by. Your ability to overcome gravity depends on how much joy you share. The judges praised its innovation and surreal, distinctive visuals. The event took place alongside The Gaming Summit. It was a huge success and we look forward to returning to Jordan next year. Read about all the entrants in this edition of the Big Indie Pitch over on our sister-site PocketGamer.com. You can also read our thoughts on The Gaming Summit and Jordan's games industry here. Watch this space for the results of the South Korean Big Indie Pitch, sponsored by G-STAR, and 2019's overall Big Indie Awards, sponsored by Jagex Partners. You can sign up for other Big Indie Pitches – and be in with a shot at prizes, promotional spend, and press coverage – at www.bigindiepitch.com. The next big session will be in London in January, alongside PG Connects.